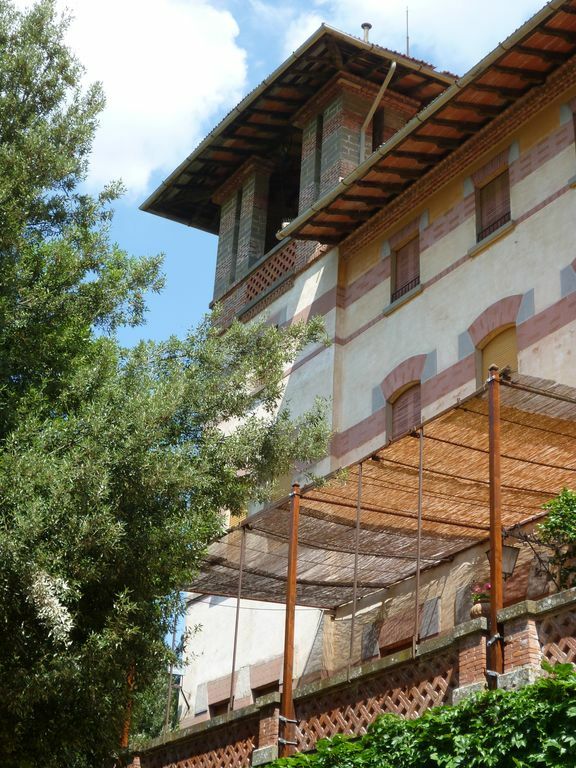 In the countryside of Chianti Classico, the villa has an antique furniture and nice,garden, large terrace and pool. The villa is included in an exclusive farm of Chianti Classico and is located near the winery that produces wine and olive oil high in discounted qualità.Tariffe the length of stay. At 8 km away is the famous Circle of UGOLINO GOLF , the first Club in Italy with a 18-hole green. This place was breathtaking -- a beautiful old villa (built around 1890), filled with amazing antiques and art, spacious, comfortable bedrooms, with gorgeous views of the surrounding valleys and hills covered with forests, olive orchards, and vineyards. The villa is a working fattoria, producing chianti, grappa, and olive oil on the Vitiano label. Our hosts, Sergio, Georgio, and the two Rosannas were gracious and helpful. The town of San Polo is small and quiet with a couple of nice bar/cafes and a small market. A huge modern supermarket is about 15 minutes away in Figline. From San Polo it's easy to take day trips, an easy half hour to Florence, and a little more than an hour to San Gemigniano, Siena or Pisa. The nearby bustling town of Greve in Chianti also has some good restaurants. And we loved the wonderful trattoria in Poggio alla Croce, about 5 minutes away, with terrific wood-oven pizzas and delicious desserts. But we also spent a few days relaxing, reading, snoozing, listening to the birds, cooking our own meals, and of course having a glass of wine or two in the afternoon. This is the perfect place to experience the beauty and flavors and lifestyle of Tuscany. Dear Suzanne and Vincent, thank you for your nice review, which we really appreciated. You have been excellent guests and it has been a pleasure for us to meet you and host you. we hope you will be able to come back to Tuscany and villa le Camelie. La maison de famille parfaite pour des vacances italiennes! grazie delle tue parole e sono contenta che la tua casa sia piaciuta e tu abbia potuto avere una bella vacanza. Des lieux magnifiques en plein cœur de cette belle région. Rosana et son mari gentils, accueillants et disponibles, pour vous guider au mieux et passer un séjour inoubliable. La maison c'est l'endroit où le temps s'est arrêté ! Pour les sportifs la piscine a une belle longueur ! Nous avons passé d’excellente vacances dans cette superbe maison. Accueil très agréable, la vie de château pendant 15j était très agréable. Je conseille vivement cette location pour camp de base pour visiter la Toscana, elle est très bien placée pour visiter de nombreux sites (Florence , San Gimignano, sienne, Pise, lucca...). De plus la piscine est fabuleuse !! We are happy that you have had a nice holiday in the villa Le Camelie. You have been excellent guests! We were two families travelling with 5 kids and stayed one week at the Villa Kamelia. We had a wonderful stay and felt very well taken care of by the hosts. The house itself is very impressive, the interior is very spacious and even the 5 bedrooms are huge. The kids felt they were in a castle and could play hide and seek for hours! Although we spent most time outside and therefor not using the dining- and living room those were both very charming. The kitchen and bathrooms are functional and have all the equipment needed. Outside we enjoyed the big pool with its calm location and beautiful view. The location of the Villa is high up on a hill, which gives a stunning panorama view of the surrounding, but unless you are a Tour biker or extreme runner you need a car to go anywhere, even if you´re only going down the hill to the sleepy village of San Polo. That I would say is the only slightly negative, that it isn´t in walking distance to anything. With car on the other hand you have everything from Florence to Siena available for day trips and plenty of shopping and dining opportunities less than a 30 minutes drive away. All in all we had a tremendous week and all 9 enjoyed our stay, thanks to our hosts Rosanna and Rosanna, Sergio and Georgio who let us use their truly unique Villa. "Un séjour de rêve dans un château aux meubles et décorations 19ème et début 20ème; des chambres gigantesques, de belle salles de bains, une cuisine superéquipée où on peut vraiment cuisiner pour un grand nombre, une belle piscine, une terrasse énorme...les photos sur le site ne rendent compte qu''imparfaitement de la qualité des lieux....De partout de très beaux points de vue sur le Chianti,ses vignes, ses oliviers,ses collines, les villages...Certes, certes la route pour y accéder est pentue mais un tel lieu se mérite. A proximité de tous les lieux à visiter dans la journée et la villa est supercalme le soir pour le repos. Merci à Rosanna et Sergio pour la visite de leur cave, pour leurs excellents produits - chianti classico,réserve, grappa, vino santo...huile d''olive-, merci pour leur passion qu''ils savent transmettre. Merci à Alessandro et Luciana pour la gentillesse de leur accueil, leur courtoisie, les explications fournies. Tout le groupe d''amis garde un fabuleux souvenir de cette semaine dans leur domaine. Franchement nous recommandons mais seulement aux amateurs de belles choses, de bons produits, de la vraie Italie et de la belle Toscane !" Near S.Polo in chianti there is the church of San Miniato at Robbiana was consacrated n 1077 . GREVE is the only commune in the province of Florence that lies completely in the Chianti area, therefore it is considered the "capital" of this region, whose products of Chianti Classical wine and olive oil are reknowned the world over. SILIANO( where Silla settled a colony of his veterans and where a beautiful Romanesque church may still be admired); LUCOLENA is another, reminiscent of an ancient temple dedicated to the vestal virgins.